Utrecht-based SEMdesign created this low-impact faceted bowl that is made entirely from cardboard so it can be easily recycled or composted at the end of its life. 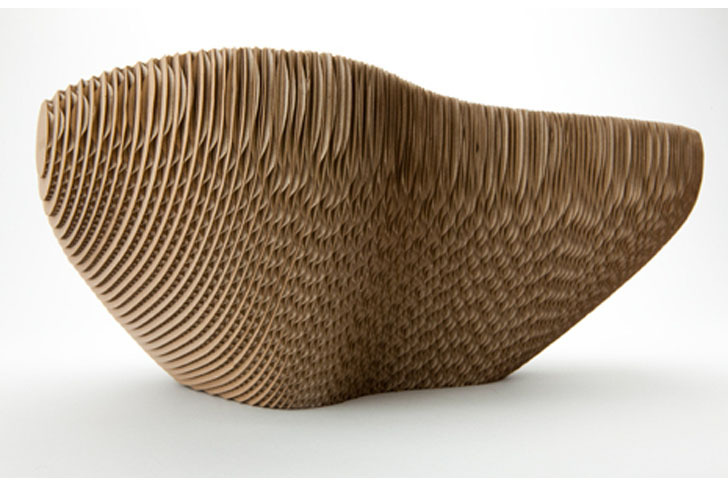 Named “Fruit Bowl 128 Cardboard”, this stripey bowl was made by laser-cutting and affixing 128 different pieces of recycled cardboard together. Established by Sylvie van de Loo in 2005, SEMdesign specializes in innovative product design with a conceptual and humorous touch – and their “Fruit Bowl 128 Cardboard” is no exception. With its playful organic shape and its clever use of everyday material, this eco-friendly object will hopefully inspire and remind its owners to eat healthy fresh fruit on a daily basis. If you feel crafty and think that you can manage to DIY it, SEMdesign have kindly uploaded a free open source manual for the “Fruit Bowl 128 Cardboard” here! Utrecht-based SEMdesign created this low-impact faceted bowl that is made entirely from cardboard so it can be easily recycled or composted at the end of its life. Named "Fruit Bowl 128 Cardboard", this stripey bowl was made by laser-cutting and affixing 128 different pieces of recycled cardboard together.